Spec-built but created with character, the second Baglietto 48 metre T-line is an active family’s platform for play. Risa Merl feels the fun factor on board Silver Fox. Semi-custom yachts exist along a spectrum: at one end are those with identical exteriors that share a technical platform, with differences only appearing in the interior style and perhaps the layout. At the other end, you will find more flexible experiments in semi-custom building. These are yachts that start off with a set design but which can be modified to try out new ideas in space planning, facilities and even exterior styling. At this far-flung, creative edge of the spectrum, the result is often two sisterships that are anything but identical twins. The 47.6 metre Silver Fox is the second in the Baglietto T-Line 48 series, yet she stands apart from hull No 1, Andiamo – which itself was launched in 2017 as an update on the Baglietto 46 series. The changes seen on Silver Fox are notable and purposeful, from expanded glazing and a refined exterior profile to completely relocating the tender storage in order to add a beach club. “We want to be more flexible than everybody,” says Michele Gavino, CEO of Baglietto, who speaks of creating “flexible platforms” in which a series can be further customised to a specific owner. 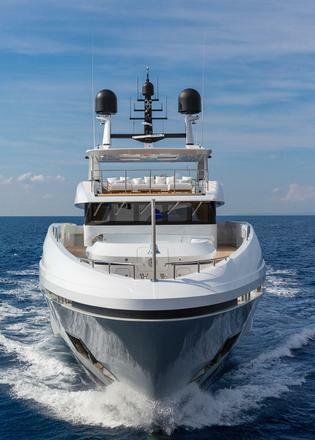 The T-Line 48 typifies this ideal: Andiamo was ordered by an owner and customised to his needs from the beginning, whereas Silver Fox began on spec, which allowed the yard to upgrade its second offering, basing the changes on client feedback and studying the competition. “Everyone is looking for natural light, everyone wants to be near the sea,” says Gavino. The Italian builder took feedback from owners and enhanced these priorities on the 48 series. Andiamo’s aft tender garage has been done away with on Silver Fox to create a proper beach club – outfitted with a bar, gym and steam room – by moving all tender and toy storage to forward on the upper deck. The exterior lines of the T-Line 48, created by long-time Baglietto collaborator Francesco Paszkowski, were changed as well – windows were enlarged and extended from floor to ceiling. 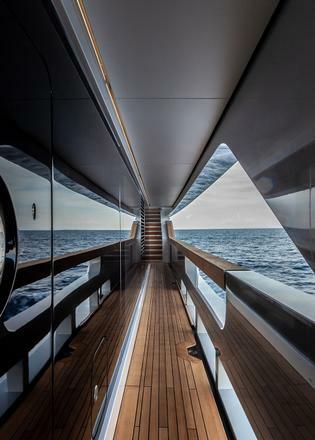 This redefined the yacht’s profile, especially on the bridge deck where the glass has been extended, creating a hexagonal shape, with this geometric motif continued in Silver Fox’s interior design. Gavino took on the role of an owner during the build and helped guide the brief. 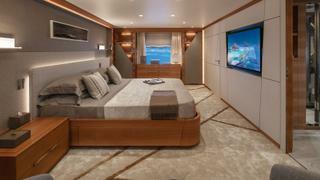 This provided a more personal touch and also challenged the in-house design team, which created the yacht’s interior. “I try to be the naughty guy in some way, giving tough critiques,” says Gavino. 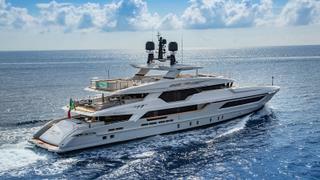 “I put myself in the owner’s shoes and question if what we’re doing is really the best way to do it.” Silver Fox also breaks the mould by being the first spec-built Baglietto to feature interior design from the builder’s in-house team. “It’s the first we’ve done entirely in-house since I joined the company, and I wouldn’t do it on a prototype, but we know this platform well,” he says. The eventual owner of hull No 2 bought her before the 2018 Monaco Yacht Show, allowing him to take delivery soon after she appeared there. He had a vision for the yacht he wanted but didn’t care to spend three years creating it. 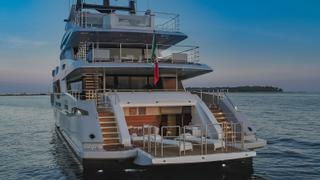 His ideal yacht would have Italian heritage, a bright interior, ample outdoor spaces to suit his family’s active lifestyle and foster a strong connection to the sea. Silver Fox’s owner and his family have, over the years, had many Italian-built yachts, from yards such as Sanlorenzo and Azimut, as well as a refitted Benetti. Working with Edmiston, they visited several yards in search of their new yacht, focusing on marques with pedigree rather than new brands that didn’t have quite such a proven track record. The yard had to have history, and while spec-built was fine, it shouldn’t be completely standard. “Baglietto has one of those brand names that you know. And they’ve built some iconic boats, like Cavalli’s,” says Silver Fox’s owner, referring to the striking 40-metre yacht now named Ability, built for fashion designer Roberto Cavalli. 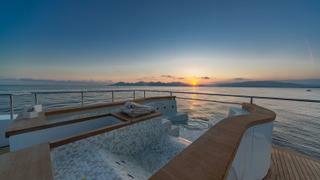 “What was attractive about this yacht was the phenomenal outdoor space and the very modern, bright interior,” says the owner. The interior features cosy and intimate living areas, perfectly formed to take in the sweeping vistas seen through the expanses of glazing on the main and upper decks. Instead of a vast open-plan main deck, the living space is split in two with a saloon aft and dining room forward, while a stand-up bar greets guests upon entry from the aft deck. Neutral tones were employed to play to a wide audience, but this palette also creates a welcoming, bright space. The main saloon has a thick, cream carpet and a comfortable white L-shaped sofa. Twin armchairs to port take in views from the large windows, which, as on the upper deck, are full height. The bulwark outside is sculpted and slim to allow for views while seated in the saloon. The circular coffee table, with its bronze legs, helps establish an interior theme of updated mid-century cool, with plenty of metal detailing. Before signing on the dotted line, the owner had considered brokerage boats, but was turned off by the excessive dark wood panelling – and he wasn’t keen on a refit either. In Silver Fox, he found the light, modern interior he was after. 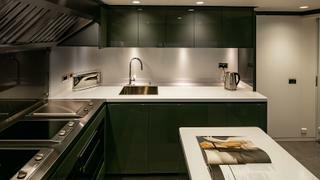 The interior designer chose “very typical Italian woods” – Italian walnut for the walls and Canaletto walnut for the floor. Wall surfaces vary from wood to white fabric and even wallpaper made to look like leather with fine gold flakes. The dining room is divided from the saloon only at the centre, allowing each space to feel private but connected. This wall is a spectacle in itself, adorned with a smoked mirror and bespoke brass artwork with angular cutwork designed by Attuoni. 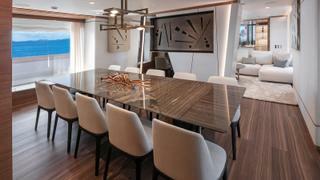 The dining table, in tobacco brown marble, is made up of different triangular cuts of stone, pieced together. Sensibly, the forward bulkhead wall is designed with plentiful storage for dinnerware. Nor does he mind the snug saloon. Baglietto designed the main deck with a generous crew mess and galley – a major selling point for an owner who lives by the maxim “happy crew, happy guests”. A separate interior passageway and stairs allow the crew easy access to service guest areas, and a dumb waiter goes from the main deck galley to the pantry on the upper deck and on up to the sundeck. The upper saloon is also an intimate space rather than a grand one. It’s the world outside that draws attention, through those huge windows. The trend towards smaller saloons works well for owners who focus on enjoying life out on deck. On which note, the new beach club suits this family just fine. “We can start playing back on the beach club while the crew are up front pulling off the toys,” says the owner. Some of the family are very keen on keeping up their exercise routine while at sea, so having a gym in the beach club was a perk. The area can be accessed internally, so the space can also be used when under way or quayside. “I have teenage children – and sisters with children – so this will be a very active boat, not one where we are just smartly sitting inside,” he says. “We have lots of toys and this will be a very fun, informal yacht for family and friends – we’ve bought it to have fun.” The new boat is stocked with plenty of toys, including an electric surfboard, hoverboards, a canoe, paddleboard, a slide and “the two fastest Sea-Doos they make”. 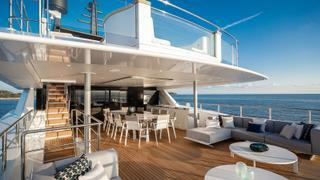 Baglietto is particularly proud of the yacht’s expansive sundeck, a feature that is part of the builder’s DNA. It extends 140 square metres and includes an infinity pool, dining space and sunbathing area. “We love open spaces on board and the connection to the sea,” says the owner. “Our other passion is skiing, and it’s the same idea – it’s just you and the ocean or you and the mountain,” he says. The bedroom itself is adorned with smoked mirror detailing and Hermès for Dedar fabric walls. “We wanted the suite to be a soothing space,” says Attuoni, who custom designed the carpet and bedside tables. Silver Fox’s staircase marks another change from hull No 1. Whereas Andiamo’s staircase was round, this one is angular, with glass partitions used to let light descend to the lobby and cabins below. The top of the stairwell is fitted with coloured lights. “Whimsy, without being too disco,” says Attuoni.